Skins manufacturer Slickwraps would figure to be the kind of accessory manufacturer that would get an early heads up on the design of an upcoming handset. The company's CEO, Jonathan Endicott, sent out a tweet this morning showing off a CAD designed image of the Samsung Galaxy Note 8. 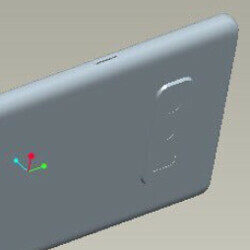 The image appears to match a previous sketch of the phablet that was apparently made from a similar CAD leak. There is also some similarity to a very ugly design tweeted by tipster OnLeaks during the last few days of June. Considering that Slickwraps is apparently betting its money on the image seen on its CEO's tweet, we have to consider that this could be a legit look at Sammy's next high-end phablet. As we told you last month, a Samsung executive said that the fingerprint scanner for the Galaxy Note 8 will not be under the glass. Some were expecting this feature for the Samsung Galaxy S8 and Samsung Galaxy S8+. When the technology couldn't be made ready for prime time, many expected Samsung to have everything in place for the Galaxy Note 8. All three designs for the Galaxy Note 8 found in the slideshow reveal a rear-facing fingerprint scanner, which is sure to upset many potential Galaxy Note 8 buyers. Unlike the placement of the rear-facing fingerprint scanner on the Galaxy S8 and Galaxy S8+, which is too close to the camera and can lead to smudges on the lens, the Galaxy Note 8 will have some separation between the scanner and the dual camera lenses according to these images. "All three designs for the Galaxy Note 8 found in the slideshow reveal a rear-facing fingerprint scanner, which is sure to upset many potential Galaxy Note 8 buyers." Not sure about that. Muscle memory makes it easy for me to adapt to the position of the rear fingerprint reader. It's just a matter of few days to get used to it. This has got to be the most horrible back design in recent years. The BOGO deals on this one will be through the roof tbh. Just like the s8. Even kiko is buying one of those because they were 80% off.. After just 3 months. Now watch the Samsung fans in denial. Funny how most of the comments in a Samsung article are from Samsung haters, then you guys complain about Apple haters on Apple articles. Oh the hypocrisy! Hope your insurance is ready too. Why would anyone need to be insured for having the best phone around? Because the dumb azz is making fun of the note 7 problem. My card, account, and body is ready! I'm already used to the fingerprint sensor on S8+ so going to the Note 8 will be a breeze! Design looks great. Let's hope Samsung fixes the lag that affects all of its devices. Gross design. Sammy genuinely made a thing of beauty in the Galaxy S8, but that weird, inch-thick, square, crowded camera just f**ks up the Note8's whole design. Hard pass. He's ready to marry his Note 8. Listen to him lie how the note 8 changed his life.. And how he could never have done anything on earth without it and yet run to buy an iphone 8 at the very first opportunity. He likes both, but thinks that for the last several years Samsung phones have been better. Why does that threaten you? Ted, I find it odd they get so bothered by my choices lol. I've have the right to buy what I want just like they do, and speak about what I spend my hard earned money on. I'm an iPhone user as well, and if the iPhone 8 is good enough, and has: Split view Slide over picture in picture Pencil support Themes or a new look to the UI, then I could go for it. However, you can pencil me in for the Note 8. Based on how good the S8 Plus is, I know I'll love the Note 8, that heaven sent S-Pen. Bankz gets pissed, when I do exactly what he does...rep my favorite brand. I simply tell it like it is, and he doesn't. He acts like the iPhone is perfect, and man is it not. It lags, it freezes, my unit has failed to launch the camera at least 5 times. It gets app crashes, and my S8 Plus is the more consistent performer of the two. In fact, it's so Good, I had no problem selling my 7 Plus last Wednesday, putting up the money for my Note. I could go for an iPhone 8, hell I love iPhones, but I will be brutally honest about its performance, my likes and dislike, and what it needs and lacks. Bankz will simply lie, and omit things. I won't. Bankz, I can easily afford both. The iPhone 8 rumors leave me uninterested. It has no cutting edge software features than currently interest me. The Note 8 has plenty. I know it hurts, that I'm not team Apple, but I buy what I want. Samsung simply makes the better phones, chocked full of options, and they're also gorgeous. IPhones are a bit dull now, and pretty boring, not too much to get hyped for. I sold my 7 Plus, and will use that money to get the Note 8, iOS is now better on the iPad, cause Apple brought over a lotta Note line features to it. I'm grown, and can buy what I want, and I'm getting a Note 8. Let that sink in. Says the guy who celebrated when the iPhone 7 was water resistant so that he can put lube on it now. What happen to the cool design with scanner in center with better reach given this be a tad longer? It hasn't been released yet. Rumors abound. I certainly hope Samsung learned from the criticism of the S8 placement. The bigger the phone, the worse that design will be. Yeah, for most it's not ideal, but I got used to it very fast. Now it's simple muscle memory. Occasionally takes 2 tries. It's just not an issue, considering how good it looks, the great battery life, the smooth performance, and all those great features. Well worth getting used to a rear FPS. Well this time they put the heart rate sensor in between the camera and the FPS, but I still don't think that justifies it.